Just like Yamaha’s apps and instruments themselves, this update will inspire and enable musicians to take their abilities to the next level. - Jason Nyberg, marketing manager, Yamaha Music Interactive, Inc.
Yamaha Music Interactive, Inc. announced a significant update to the Yamaha MusicSoft Manager app, which can backup Yamaha instrument data or restore data to the instrument. 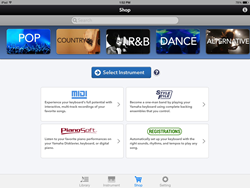 With the update, users can now shop many of the products available at the Yamaha MusicSoft Store from their mobile iOS devices, purchase items and then transfer them to their musical instruments. In addition to instrument specific MIDI songs, the update puts PianoSoft, Style Files and Registrations at a user’s fingertips. In addition to being able to easily purchase content from the Yamaha MusicSoft Store, the app enables content to be managed and moved between an instrument’s internal memory, any attached storage device, computer, iPad, iPhone, iPod touch or Dropbox. It also permits users to restore data to an instrument through a WiFi or wired connection (with compatible models), Dropbox or the iTunes file sharing feature. Another benefit musicians will appreciate is that changing file names and other time-consuming functions when performed on an instrument can be done more quickly and easily on the app itself. The app’s versatility is extended by the new Yamaha UD-WL01 Wireless Adapter, available in May for a MSRP of $120. Once plugged into the USB port of select Yamaha Clavinova, Tyros and Motif XF instruments, the adapter creates a wireless connection to nearby iOS devices that enables users to operate the app right from their keyboards. The MusicSoft Manager app, which debuted in November 2012, is free from the App Store and works with the Yamaha DTX400 series e-drums, the CVP 600 series Clavinova digital pianos, and the PSR-S750, PSR-S950, Tyros4 and Tyros5 arranger workstation keyboards. It is available in 28 countries including the United States, Canada and the United Kingdom. More compatible instruments are planned in upcoming releases. For more information, please visit http://4wrd.it/MUSICSOFT_MANAGER. iPhone and iPad are registered trademarks of Apple Inc. App Store is a service mark of Apple Inc.